This one is a reread – I recently rejoined the 19th Century reading group to keep reading classics – Most of their choices are books I’ve not read. The Kreutzer Sonata is a darned good story with historical value (which is mostly why I enjoy classic literature). Also, it’s interesting biographically because of Tolstoy’s post-Anna Karenina trauma and spiritual transformation. Although Anna was not a “good” girl, during the course of writing her story Tolstoy had fallen a wee bit in love her. This raised some serious questions in his mind because Tolstoy was, at heart, a Christian! How could he write so beautifully about a “fallen woman?” He struggled with both depression and his core beliefs the result being that he denounced Anna Karenina – his “perfect” novel – as vanity along with his prior works. Anna Karenina was first published in 1877 and by 1879 Tolstoy published his memoir, “Confessions,” describing his developing philosophical ideas. 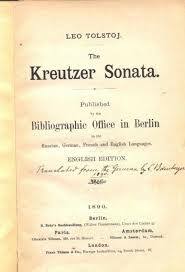 The Kreutzer Sonata was published a full 20 years after his spiritual collapse and conversion – it shows. This is not like The Cossacks or War and Peace (great fun, both of them) in simply describing the foibles and transgressions of man/woman-kind. The Kreutzer Sonata is more of a long personal sermon on the troubles caused by women and their need for marriage and lust in general but specifically of jealousy. The novel highly recommends celibacy and I don’t believe that Tolstoy ever put on a “narrator” hat – he is alway his own narrator. It’s a good story, though – and Tolstoy was still writing very nicely – he simplified his style over a longer term.